What does it take to make a breathalyzer? 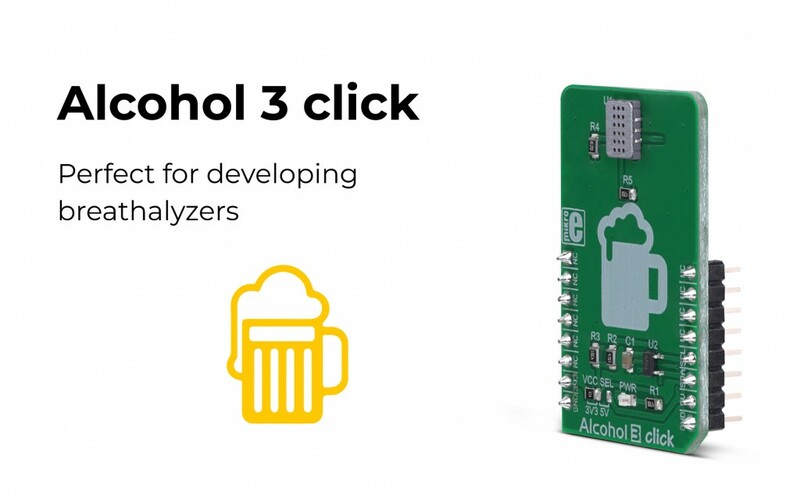 Well, you can start with equipping yourself with the latest alcohol detecting click, the Alcohol 3 Click board™! The Alcohol 3 click is a gas sensor Click board™, equipped with the MiCS-5524 - a compact metal oxide (MOS) sensor. This sensor reacts to the presence of deoxidizing and reducing gases, such as ethanol (also known as alcohol). Its impedance changes as a result of a catalytic reaction, allowing it to be used in a voltage divider configuration. The voltage can be sampled by an accurate A/D converter (ADC), allowing the data to be read directly over the I2C interface. A robust sensor, the MiCS-5524 can be used in harsh environments for gas leakage detection, in breath checking applications, early fire detection, etc. The Click board™ represents an ideal solution for rapid development of all kinds of breathalyzer applications, gas leakage applications, fire detection applications, CO detectors, and similar reducing gasses detecting applications. For more information about the Alcohol 3 click, please visit our website.